Yes, it's true - SurveyPocket is the only mobile field research and data collection app that supports both offline and online survey functionalities. If you are familiar with setting up branching logic in SurveyAnalytics via the online survey tool, you will now be able to branch survey questions and use it in SurveyPocket’s offline iPad app and take it anywhere you want in the world for your field research needs. Are you looking to target specific questions for specific respondents in the field and don't want to worry about your field team needing to be tethered to wifi connection? SurveyPocket's branching capabilities has got you covered! How to set up Branching in SurveyPocket? 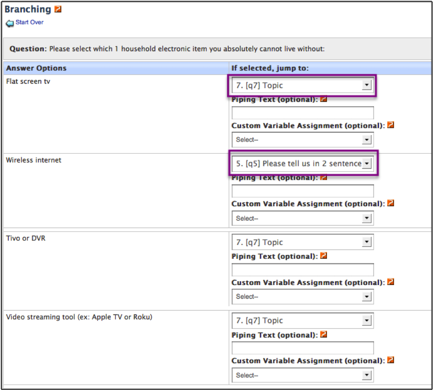 It's easy to set up branching to use in SurveyPocket. Make sure that before setting up branching logic you should set up the entire survey with all the field research questions. In our example below we want to target respondents who state they cannot live without wireless internet. If they selected wireless internet we want to ask them a follow up branching question on why they cannot live without it. If they do not select this as an option they will be branched to another question in the survey. 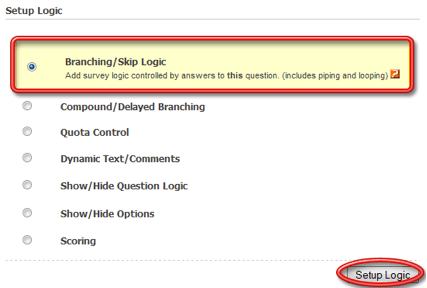 Step 1: Click on the Add/Update Logic link for the question on which you wish to set up (base) your branching logic. Step 2: Select the Branching / Skip Logic option and click on the Setup Logic button to go to the next screen. Step 3: Select the destination question from the jump to list for each answer option and click on Update Branching Information button. Step 4: Create a device key to test on the SurveyPocket app. 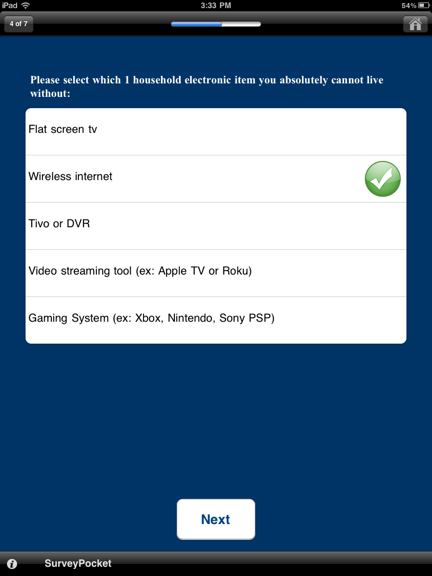 Step 5: Pull up the SurveyPocket App on your iPad or iPhone and type in the device key. Step 6: Test out your survey on the iPad. Selecting Wireless Internet will branch to the open-ended question about why they cannot live without it. If selecting other options should skip the open-ended question and move to another question topic. Branching Logic: Skip to rating scale question. Step 7: Click on the Synchronize button on SurveyPocket when online connectivity is available. This will allow you to view report faster than ever and begin the analysis process. To learn more on how to use SurveyPocket for field research or data collection, or to set up a free trial demo of SurveyPocket go to http://www.surveypocket.com or click on the logo below to view & download SurveyPocket to your iPad today! BION I'm imeprssed! Cool post!